My favorite quote about pasta comes from the lovely Sophia Loren, “Spaghetti can be eaten most successfully if you inhale it like a vacuum cleaner.” So true! 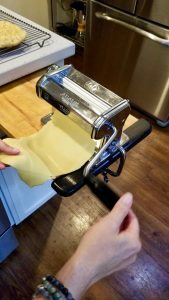 Pasta is the easy food of choice in our house, which is why we spent so much time getting our Italian style egg pasta recipe perfect. So think Hoover, and grab a fork. You are going to love our pasta. Best of all, you will never know it’s gluten free! The ease of this recipe will wow you. The most time consuming aspect is rolling the dough through the machine, however, the process is not difficult. You will not have to flour the dough or the machine, and the dough is a delight to work with – very forgiving. 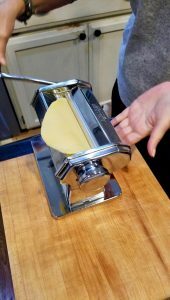 Here are a few tips to help you make that perfect pasta dough. 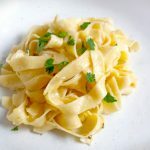 The pictures demonstrate how your pasta dough should look. 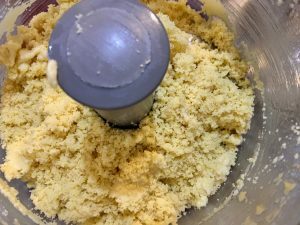 The dough in the food processor looks like coarse particles of sand or a bit like cooked cous cous. Particles stick together when pinched, and roll out to a silky, smooth ball of dough without the addition of flour sprinkled all over it. The dough comes together in a matter of minutes. Our time saving secret? 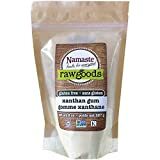 We keep jars of premixed pasta flour ready to go. Step 1: In a small bowl, beat the eggs and oil together with a whisk until thoroughly combined. Pour the mixture into a liquid measuring cup. Add enough water to equal 190ml (or 6.5 oz). If you add too much liquid, the dough will be sticky and start to form a ball when processed. You want coarse sand like particles of dough, not a sticky ball of dough (see picture in blog). Step 2: Whisk together the dry ingredients and pour into the bowl of the food processor. Secure the lid, and turn the machine on. Pour the liquid mix into the dry mix – slowly, which will allow you time to stop adding water if the particles start to clump. Stop the machine as soon as you finish pouring the liquid. Remove the lid and scrape down the sides and lid of the bowl. Replace lid and pulse a few times to incorporate. 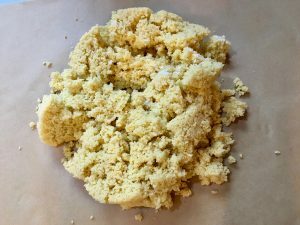 The dough should look like coarse sand and stick together when pinched. If it does not stick together, add one more tablespoon of water and pulse to combine. If it feels wet and sticky, add tapioca flour one tablespoon at a time (and pulse) until it feels dry and sticks together when pinched. Step 3: Dump the contents of the bowl onto a sheet of unbleached parchment – no need to flour it unless the dough feels sticky (which it shouldn’t.) Knead for about 1-2 minutes until a smooth ball forms. If it feels sticky at all, sprinkle tapioca flour and knead until it feels silky and smooth. Flatten the ball into a disk and cut into four equal pieces. Cover the pieces with cling wrap to prevent them from drying out. 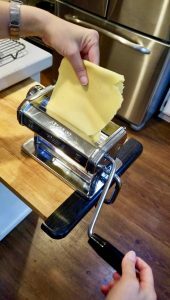 Note: The following directions are for using a pasta machine. You may roll out the dough between sheets of parchment to your desired thickness and cut with an appropriate utensil. 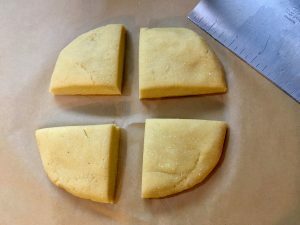 A pie crust bag works wonders with this method! If you fold the dough over on itself to cut, make sure you flour the surface first to prevent sticking. 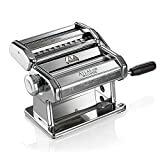 Step 4: Flatten one piece of dough with your hand and run it through the pasta machine set to zero several times until the dough feels silky smooth and is easy to roll. Roll the dough through to flatten the first time. 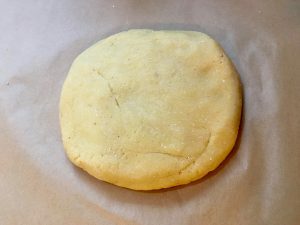 The dough will appear rough and sorry looking. It may even be ragged, and tear in places. Not to worry! Fold the dough in half and try to fold in sides to make a nice looking rectangle and then run the dough through it again. Keep folding until the dough looks and feels good enough to move through level 1. Step 5: Repeat step 4 with the machine set to level 1. You may only need to run it through 2-3 times. Step 6: Set the machine to level 2. Do not fold the dough over on itself at this level. Just run it through the machine 1-2 times to smooth and flatten. Repeat for levels 3 and 4. Step 7: At this point you can decide to make thinner pasta and move the setting to level 5. We mostly use level 4. On level 5, we have to cut the sheet of dough in half to avoid breakage and to make the cutting process more manageable. 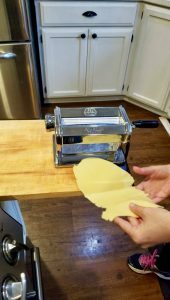 Step 9: Dry the pasta on a pasta dryer or nest the strands on a sheet of parchment until ready to cook. 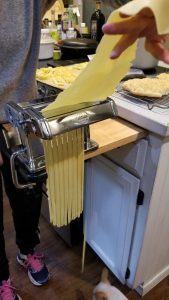 Fresh pasta cooks in salted, boiling water in 30 seconds to 2 minutes depending on your bite preference and how long it has had a chance to dry. Step 10: Rinse cooked pasta in water (don’t skip this part,) and then serve immediately with your favorite sauce. Storage: We have successfully kept our pasta in the refrigerator for up to 2 weeks, but one week is best. If freezing, its best to completely dry the pasta after cutting and then freeze for up to a month. The nutrition information provided below is for the recipe as written using the acacia fiber and 1/2 tsp or 3g of pink salt. 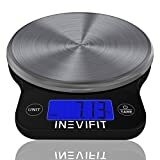 Each serving weighs about 2 oz or 57g.